The weather hasn’t been the best here in Chester, today (August 11th!). We’ve been pulling on jumpers and bemoaning the Great British Summer. But, whilst we mourn the summer, there’s a reason to look forward to September… Yes, Strictly Come Dancing is back!! 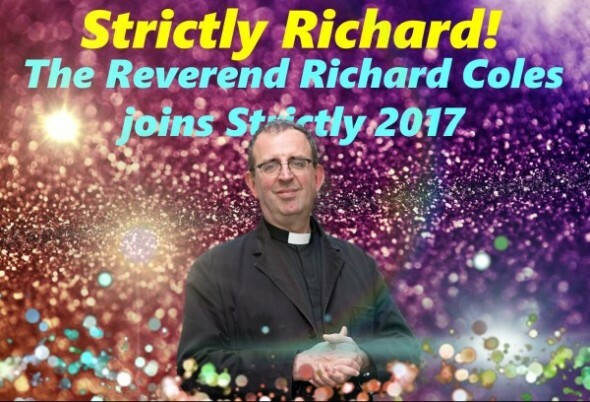 Our bemoaning was halted (we are honestly an optimistic bunch for the most part) when we were alerted to some breaking Strictly news… joining the celebrity line up and swapping his dog collar for sequins and his pulpit for the promenade: Church of England priest, Reverend Richard Coles. The former Communards keyboard player said: "Cometh the hour, cometh the overweight vicar with arthritis in his knees." as the news was broken this morning. The Reverend Richard Coles is the only UK vicar to have had a hit single, having first found fame with the Communards and their hit single, “Don’t Leave Me This Way”. It topped the charts for four weeks and was the biggest selling single of the year (1986)! Now, he is the vicar for St Mary’s Church in Finedon, Northamptonshire, Reverend Coles also presents BBC Radio 4’s Saturday Live and is a contributor to Pause for Thought on Chris Evan’s Radio 2 show, as well as being a frequent guest on Have I Got News For You. He documents his journey from pop to pulpit in his autobiography, Fathomless Riches - it is a deeply personal and illuminating account of a transformation from hedonistic self-abandonment to 'the moment that changed everything'. In October, as he limbers up for the glitterball trophy, he also releases the follow up, Bringing in the Sheaves: Wheat and Chaff from my Years as A Priest. Written with extraordinary charm and erudition, Bringing in the Sheaves features a multitude of characters and events from parish life against a backdrop of the Christian calendar. Rev Coles is the fifth confirmed act for the popular Saturday night entertainment show, alongside model and actress, Gemma Atkinson; TV presenter, Ruth Langsford; TV actor, Davood Ghadami and singer, Mollie King.